Crayon Bookmark measures about 26 cm (10.2 inch). 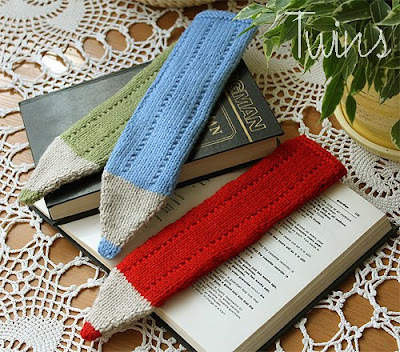 All pieces of the bookmark are knitted flat. Cast on 5 sts using main color. Change yarn into main color. Repeat from * to * 31 times more. (If you need longer bookmark, repeat from * to * a few times more than in the pattern). Next: 4 rows K all. Cast off. Cut yarn.